Salamanders are any of the species of amphibians that belong to the taxonomic order of Caudata. There are more than 500 different species of salamander found throughout the world. Salamanders are amphibious creatures meaning they have the ability to live in both water, and on land. Internal or external gills, lungs, simple airs sacks, and valerian respiration ( respiration through the skin) enable them to do so. Depending on the specie, they might have a combination of the respiration processes or just one. Some think lizards are the closest relative because of the similarities in looks, but really the frog is the closest relative. Salamanders have a slender body and a slender tail which usually ends up growing the same length as the body. They have two arms and two legs which makes up the four limbs for locomotion. Most species have an interesting toe count because the front legs( or arms ) have four toes on each limb and the back legs have five on each limb. Color and length also vary between species. Color depends on habitat, if venomous, or if it is mating season. In length, Salamanders are relatively small and stay around 3- 7 inches, but some can get as small as 2.7 cm long, or can get as long as 5.9 ft, and weight 140 lb. For reproduction, depending on the species, salamanders can lay there eggs either in water or on land. The salamanders that live mostly in water can have up to 450 eggs. Land only produces 7 to 30 eggs at a time. There are not as many predators in water compared to land, so they are easier to protect. The parents have several ways of protecting the eggs, like wrapping them in leaves, but the egg themselves have their own protection. A toxic membrane surrounding the egg wards off enemies, which can prevent the predator from eating the rest of the eggs in the nest. Carnivorous animals are major predators, but fungal infections are also major attackers against eggs. Some land species have to keep rotating the egg to avoid infection. The general habitats for salamanders are separated into three groups . One being all aquatic, second semi- aquatic, and third is all land. To protect salamanders in general from those environment, they a secret mucus that covers their entire body. This mucus protects the salamanders that go on land from drying out. Even though they live mostly in mossy and muddy wetland, sometimes that still can't be enough. It decrease the water that leave the body so it can maintain the salt levels. For aquatic salamanders. It acts the same way but the opposite. It prevents water from entering to fast so it can maintain the salt levels. Also salamander are nocturnal, they like to live in these habitats during the night. 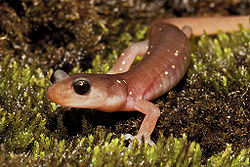 Most of their food wakes up at night, which provides good hunting ground for salamanders. Depending on the size or species of the salamander, weighs on its diets. Most salamander diets are insects and invertebrates,but bigger salamander can prey on animals as big as fish, frog, and other salamander. Salamander larvae prey upon small aquatic animals that live in water as they grown into adults. Salamander Wikipedia, unknown author, publisher, last modified on 23 February 2011. Salamander & Newt Sandiego Zoo, unknown author, Zoological Society of San Diego , © 2011 . Salamander Habitat buzzle.com, Bidisha Mukherjee, publisher, 5/10/2010. 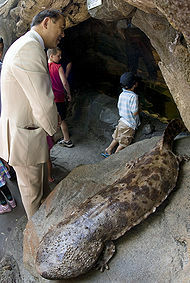 Japanese Giant Salamander unknown author, publisher, date. This page was last modified on 15 December 2016, at 14:28.